NGC 253 (the Sculptor Galaxy) is shown here with an insert that shows a close-up of the central parts as observed with the NACO instrument on ESO's Very Large Telescope and the ACS on the NASA/ESA Hubble Space Telescope. Asharp-eyed instrument on the Very Large Telescope has given astronomers a peekat the heart of a nearby galaxy, revealing a host of young, massive and dustystellar nurseries and a possible twin of our own Milky Way's supermassive blackhole. The galaxy,dubbed NGC 253, is one of the brightest and dustiest spiral galaxies in thesky. It is also known as the Sculptor Galaxy, because it is located in theSculptor constellation. TheSculptor Galaxy is a starbust galaxy, so-called because of very intense starformation there. 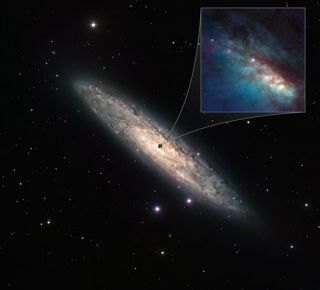 Astronomersfrom the Instituto de Astrof?sica de Canarias in Spain used NACO, an adaptiveoptics instrument on the European Southern Observatory's VeryLarge Telescope (located in Atacama desert in northern Chile), to study NGC 253 in finer detail in the near-infrared. Adaptive opticscorrects for the blurring effect that Earth's atmosphere can have on imagestaken by ground-based telescopes. Sensors and deformable mirrors correctdistortions of incoming light, producing images as clear as if the telescopewere in space. With its adaptiveoptics system, NACO revealed features of NGC 253 that were only 11light-years across. "Ourobservations provide us with so much spatially resolved detail that we can, forthe first time, compare them with the finest radio maps for this galaxy ? mapsthat have existed for more than a decade," said team member Juan AntonioFern?ndez-Ontiveros. With theimages, the astronomers identified 37 distinct bright regions ? a threefoldincrease on previous results ? packed into a tiny region at the core of thegalaxy that makes up just 1 percent of the galaxy's total size. "Wenow think that these are probably very active nurseries that contain many starsbursting from their dusty cocoons," said team member Jose AntonioAcosta-Pulido. Thecombined data also led the astronomers to conclude that the center of NGC 253hosts a scaled-up version of SagittariusA*, the bright radio source that lies at the core of the Milky Way and isknown to harbor a massive black hole. "Wehave thus discovered what could be a twin of our galaxy's center," saidteam member Almudena Prieto. The team'sfindings are detailed in the January issue of the journal Monthly Notices ofthe Royal Astronomical Society Letters.